There’s nothing better than watching a cruise ship makeover and transforming to join a new fleet. British based Marella Cruises has done just that with a stunning new time-lapse video. 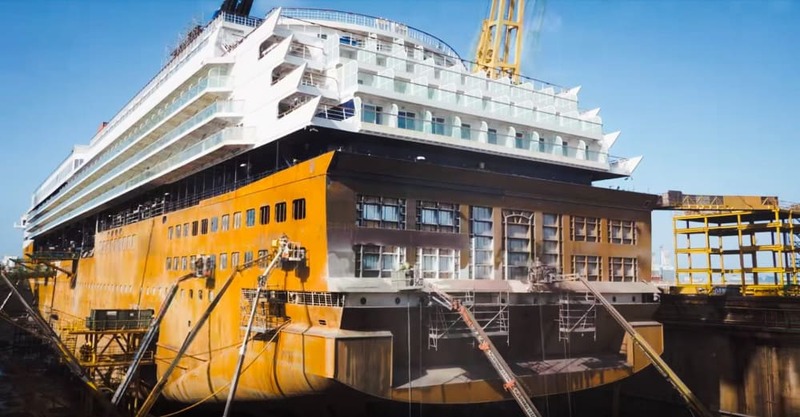 Marella Cruises has released a new time-lapse video which shows the new Marella Explorer 2 vessel undergoing a huge transformation. The massive undertaking took place at the shipyard in Cadiz, Spain, the same yard where Carnival Triumph’s transformation into Carnival Sunrise is taking place. The entire ship was renovated and highlights include a luxury Champneys Spa, a chic new bar casino space, new restaurants, an open-air swimming pool, Broadway show lounge, and mini golf. She has also become an adults-only vessel, the only one in the fleet. As usual, when it comes to major dry docks like this the ship received the news Marella Cruises hull paint, new decor, and fixtures. Cabins have been upgraded with a modern new touch including flat tv screens. Before the makeover, the ship was named SkySea Golden Era but is mainly know as Celebrity Century when part of the Celebrity Cruises fleet. The ship all this time has still been owned by parent company Royal Caribbean Ltd and will remain to do so during service for British based Marella Cruises which is formerly known as TUI Cruises. Marella Explorer 2 will expand the fleet of the UK cruise line to six ships which also includes Marella Explorer (formerly known as Celebrity Galaxy), Marella Discovery, Marella Discovery 2, Marella Dream and Marella Celebration. The new look vessel will debut on April 2, 2019, out of Palma Demajjorca, Spain. The ship will make calls in Italy, France, and Spain before returning on April 9. The ship will remain to offer cruises in the Mediterranean until November 17 when she repositions to Barbados sailing the Caribbean. In May 2020 the ship will be based out of the UK at Newcastle Upon Tyne and then Southampton. Marella Explorer 2 is an adults-only cruise ship at 71,545 gross tons featuring 14 decks, 907 cabins, 9 restaurants, 10 bars, 1 pool, and 9 elevators. She has a guest capacity of 1,814.